Protein Blend ( Milk protein Isolate, Whey Protein Isolate (Milk)), Soluble Gluco Fibre, Almonds, Chocolate Flavour Chunks (12%) (Cocoa Mass, Whey Protein Isolate (Milk), Cocoa Butter, Bulking Agent (Erythritol), Sea Salt, Sweeteners (Sucralose, Steviol Glycosides)). 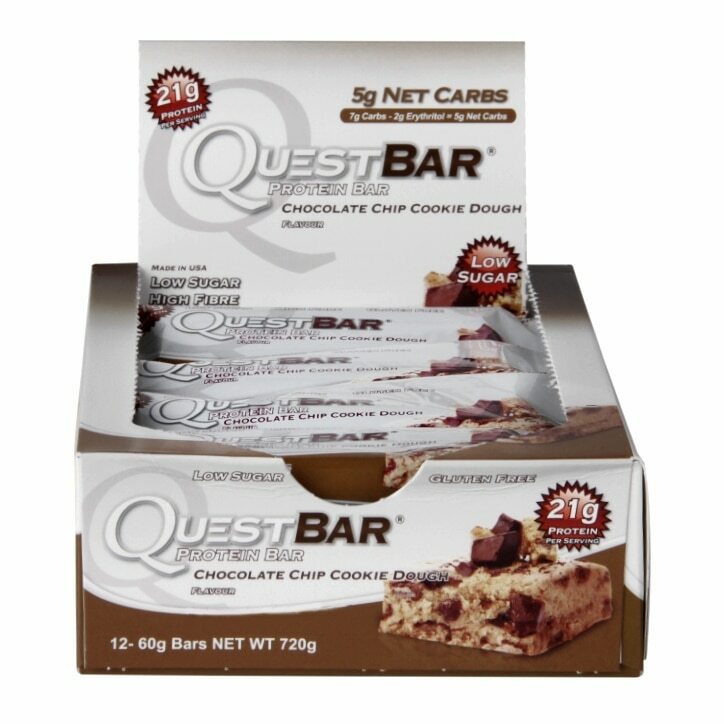 Water, Flavourings, Bulking Agent (Erythritol), Palm Oil, Sea Salt, Colour (Calcium Carbomate), Sweeteners (Sucralose, Steviol Glycosides). .
Quest Protein Bar Chocolate Chip Cookie Dough is rated 4.5 out of 5 by 13. Rated 4 out of 5 by knights from Worth it These don't have a great cookie dough taste and taste more like a chocolate chip bar, but still taste good. I put mine in the microwave so the chocolate chips melt a bit and the bar is nice and chewy. They also have a great nutritional value as they are low carb and sugar with high protein. So overall, a good buy! Rated 5 out of 5 by peewoddin from Great product If you're in a hurry these work and the numbers are good. Holland and Barrett deliver FRESH product, which is really appreciated. Have ordered on other sites but they were hard as a rock...! Rated 5 out of 5 by Pecan from Yum! These might just be my favourite flavour of Quest bars! Great tasting, filling, and with a softer texture than the average Quest bar. They taste so good if microwaved for 10 seconds before eating. Good macros.. high protein, low net carbs and sugar. Definitely recommended! Rated 4 out of 5 by SixPack008 from Yummy bars Quest Bar tastes delicious. Very handy to have those. Was browsing & saw promo on website. Bought some. Will last me for couples of week. Will definitely get some more soon. Can't complain.